It’s a privilege to be able to communicate with sources of loving messages from a higher perspective. I think those who can tune-in or read for others actually benefit twice–once from the energy exchanges, and secondly from the messages coming through–I don’t believe that any individuals are brought together at any time by mere coincidence, but there will be some point, message and lesson in the timing and substance of the exchange. Readings for a querant may also invite timely messages for the reader–otherwise the querant would have chosen another reader, or the same reader at another time. For me, symbols will appear not only in meditation and waking moments, but also in dreams. Archangel Ariel made a definitive introduction of herself in my workspace–insistent pale pink light hovered near my desk, a very supportive and gently cheerful energy offering to be called upon by anyone seeking to understand and/or embark upon their life purpose. I get the feeling that a lot of people are struggling with this at the moment–AA Ariel may benefit you to invite for help, if you feel inclined! September 21st brought messages about balance (appropriate for fall equinox) : whether alone or in collaboration, what is needed to attain new heights for any individual or couple is for both halves of a whole to work together. Feminine and masculine traits and strengths should both be honoured, healed and appreciated. 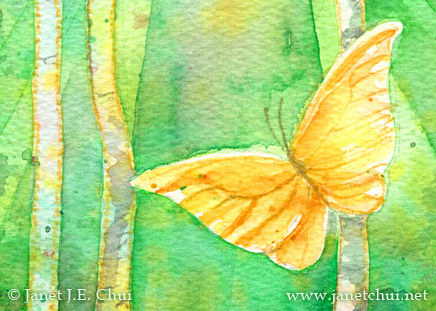 I didn’t see the connection of balance with the butterfly until writing this post–very clever symbols at work again! The butterfly needs both sides to fly. This message was meant for everyone: the gender divide needs to be closed by both sides–male and female recognising and honouring the strengths of the other, while not tolerating stereotyping, dismissal or diminishing from any side. Shameless plug: Note that I am now offering my angel card reading and spirit painting service on this site, with Etsy processing the transaction (if you’d like to go straight there). As things develop I may develop other services that either exclude the channeled painting or offer even larger paintings. I welcome any queries for custom packages!